CHEVY 350 MASTER KIT TO 1985 , 2 PIECE REAR SEAL. 030 RING'S , COMPLETE GASKET SET , CAMSHAFT , LIFTERS , TIMING SET , FREEZE PLUG KIT , CAM BEARINGS. WE OFFER MANY OPTIONS FOR R/V CAM , H/P CAMS , ALUMINUM HEADS, HIGH COMPRESSION PISTONS AND MORE. Other sizes available just messege us. Check out our Other listing for Different Sizes And Our Compltete Line Of EngineKits , Stroker Kit, Balanced Assembly's. 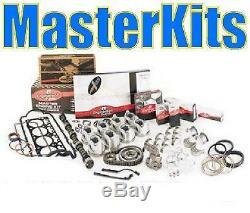 The item "Chevy 350 MASTER ENGINE REBUILD KIT'67-85'. 010 FLAT TOP PISTONS" is in sale since Wednesday, April 6, 2016. This item is in the category "eBay Motors\Parts & Accessories\Car & Truck Parts\Engines & Components\Engine Rebuilding Kits". The seller is "engineparts2014" and is located in Bakersfield, California. This item can be shipped to United States, Canada, United Kingdom, Denmark, Romania, Slovakia, Bulgaria, Czech republic, Finland, Hungary, Latvia, Lithuania, Malta, Estonia, Australia, Greece, Portugal, Cyprus, Slovenia, Japan, China, Sweden, South Korea, Indonesia, Taiwan, South africa, Thailand, Belgium, France, Hong Kong, Ireland, Netherlands, Poland, Spain, Italy, Germany, Austria, Bahamas, Israel, Mexico, New Zealand, Philippines, Singapore, Switzerland, Norway, Saudi arabia, Ukraine, United arab emirates, Qatar, Kuwait, Bahrain, Croatia, Malaysia, Brazil, Chile, Colombia, Costa rica, Panama, Trinidad and tobago, Guatemala, Honduras, Jamaica, Viet nam.